The Vegan Magpie: The Vegan Kind sheese offer! They are running a flash sale RIGHT NOW on all of their sheese! BUY ONE GET ONE FREE! Squee! 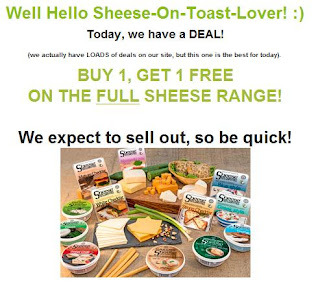 As I type this, many of the sheese products are still in stock, however I expect they will soon be all gone, so I suggest making good use of this offer asap! The offer will be visible in your basket.